As hair grows from the root (at approximately 1 cm per month), the byproducts of alcohol metabolizm are deposited along the shaft of the hair. From hair clippings, the detection of these byproducts are delayed to a certain extent; and therefore, they cannot be detected until the hair grows out a bit (2-4 weeks). The distance from the scalp of the hair portion containing drugs allows us to estimate the approximate time of drug consumption. The deposited substances are relatively stable in the face of external influences such as hair treatments, cosmetics and sunlight. Due to the way in which drugs are deposited in the hair, hair analysis provides us with a detailed view of drug consumption over the past weeks or months. Consumption on a day-to-day basis can be detected by analyzing blood and urine samples. Trace amounts of ethanol from the environment are present in all hair including in the hair of teetotalers. Simply being in a pub or laboratory is enough for traces of ethanol to find their way into the hair. “FAEE” stands for fatty acid ethyl esters, a direct and very specific metabolite of alcohol, produced in the body when alcohol is consumed. It provides a greatly specific indicator of excessive alcohol consumption over a 0-6 month period of time. Studies have showed that FAEE markers are relatively stable in hair, and that the effect of hair care and hair cosmetics on FAEE concentrations did not significantly decrease concentrations. However, recent studies have shown elevated levels of FAEE in hair could be the result from hair treatment products containing alcohol (see: Forensic Science International, 2011). This is because the cells around the hair are capable of metabolizing alcohol and leading to an FAEE byproduct. As a result, this FAEE marker is sensitive to false-positive results, therefore testing in tandem with the EtG delivers a more accurate report on alcohol abuse. “EtG” stands for ethyl glucuronide, a direct and very specific metabolite of alcohol, produced in the body when alcohol is consumed. It provides a good indicator of excessive alcohol consumption over a 1-3 month period of time. It is recommended that EtG testing is performed on the most recent 1-3 months of hair growth (approximately 0 – 3cm from the scalp). That is due to the fact that using the EtG test in isolation carries the risk of the ‘wash-out’ effect whereby the frequent washing and intense shampooing of a donor’s hair slowly removes the EtG marker that has been deposited onto the hair. As a result, this marker is sensitive to false-negative results. It is recommended that the EtG test always be combined with the FAEE test. In contrast to other drugs consumed, alcohol is not deposited directly in the hair. For this reason the investigation procedure looks for direct products of ethanol metabolism. The main part of alcohol is oxidized in the human body. This means it is released as water and carbon dioxide. One part of the alcohol reacts with fatty acids to produce esters. The sum of the concentrations of four of these fatty acid ethyl esters (FAEEs: ethyl myristate, ethyl palmitate, ethyl oleate and ethyl stearate) are used as indicators of the alcohol consumption. The amounts found in hair are measured in nanograms (one nanogram equals only one billionth of a gram), however with the benefit of modern technology, it is possible to detect such small amounts. In the mass spectrometer the substances are fired with an electronic beam. Every molecule decomposes into specific fragments. It is possible to determine which substance is present on basis of its molecular weight. However there is one major difference between most drugs and alcohol metabolites (FAEE) in the way in which they enter into the hair: on the one hand like other drugs FAEEs enter into the hair via the ceratinocytes, the cells responsible for hair growth. These cells form the hair in the root and then grow through the skin surface taking any substances with them. On the other hand the sebaceous glands produce FAEEs in the scalp and these migrate together with the sebum along the hair shaft (Auwärter et al., 2001, Pragst et al., 2004). So these glands lubricate not only the part of the hair that is just growing at 0.3 millimeters per day on the skin surface, but also the more mature hair growth, providing it with a protective layer of fat. 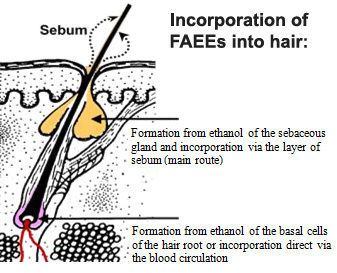 Graph 1: Possible ways of incorporation of FAEEs into hair (based on Auwärter, 2006). This means the glands supply the whole length of hair with sebum, which in turn carries FAEEs into the hair, resulting in an accumulative increase of FAEEs from proximal to distal hair sections, see next figure (Auwärter et al., 2001). This phenomenon has one important consequence: whilst most other drugs are mainly stored in the hair via the root alone, allowing toxicologists to establish time-resolved patterns of consumption according to the length of hair provided, this is not possible with alcohol (FAEEs) with respect to previous drinking and abstinence. This would only be possible using alcohol markers which enter the hair solely through the hair root, but these have not yet been discovered. However there exists a significant correlation between the intensity of the alcohol intake and the concentrations of the FAEEs in hair. Results between 0.05 and 30 ng/mg were found in hair (Pragst et al., 2006). Fig. 2: Profile of FAEE concentrations (based on Pragst, 2004). Case 1 is a strictly abstinent person. Case 2 is a social drinker. Case 3 is a patient in alcohol rehabilitation (self-reporting 60 grams ethanol per day for at least 6 months). The increase in FAEE concentrations from proximal to distal sections up to a length of 5-10 cm found in most cases could be explained by the sebum deposition route. The hair is continuously bathed by sebum, and this leads to an accumulation of the concentrations with increasing age, i.e., distance of hair from skin. As a consequence of the increasing FAEE concentrations from proximal to distal it is preferable to always analyze, if possible, a standard length of hair. 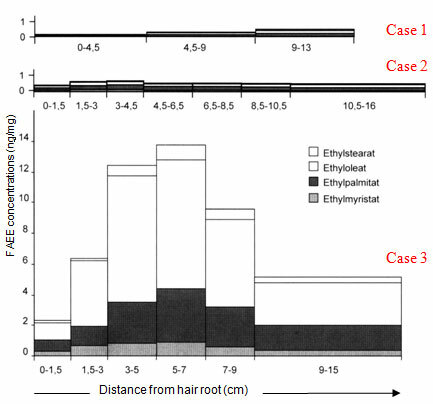 For example analysis of a 1cm hair sample taken close to the scalp will give a much lower result than the analysis of a 6 cm long sample also taken close to the scalp from the same person. For this reason we standardly use the proximal 0-6 cm segment of head hair in exactly the same procedure. For samples analyzed under these standard conditions the cutoff level is set at 1.0 ng/mg. The same holds true for body hair of any length (length is genetically determined, body hair grows more slowly and has different growth cycles, etc.). However for shorter head hair the analysis changes (e.g. : for only 3 cm we reduce the cut off level to 0.5 ng/mg). The closer the conditions (i.e. hair length) are to the standard procedure, the more certain we can be of the accuracy of the result. 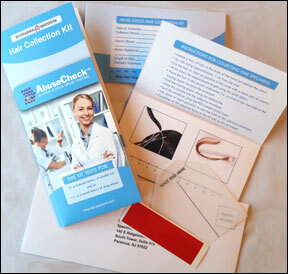 A 6 cm long hair sample can be used to look back over one to 6 months (this is commonly used in Germany to test drivers). If head hair is not available or is too short (minimum: 2 cm); underarm, chest, leg and pubic hair may be analyzed. Body hair also gives us a picture going back up to 6 months.